I LOVE embroidery hoops. I blame it first on my friend Melody, how has several hanging in her living room in fun fabrics, differing patterns, with numbers stenciled on them. I slowly acquired two or three to copy Melody and hang on MY living room wall. I just think it's a fun, cheap, easy, fabulous way to spruce up empty wall space. 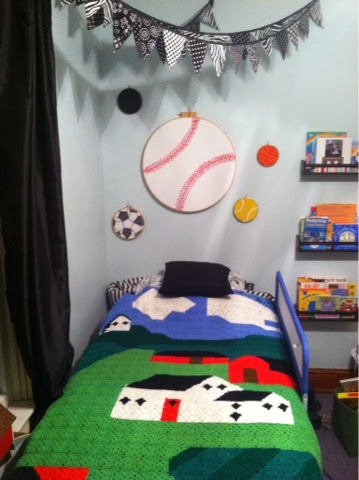 I'd love to use hoops in my child's room, but he's a boy, and more in to trains, wheels, and sports, than he is in to polka dots, checks, and stripes. 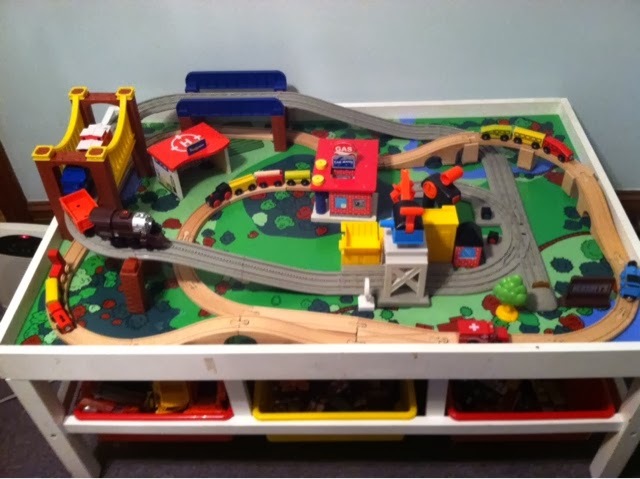 Levi spent the weekend in Western PA with his grandparents, and it was the perfect change to rearrange his room (again), purge toys (again), and make room for this beaut - a train table! A hand-me-down from his cousins, and my new babysitter. In the 12 hours that Levi has been home, he has not left his room. Also, I spent waaaaay too long constructing a train track using both of his train sets and making them intersect. Another factor in the Preschooler room update was this gorgeous afghan that my Grandma gave me. 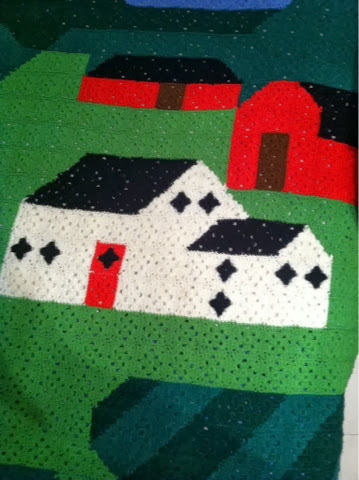 My mom made it for my brother when he was a toddler, and my grandma had been storing it in her cedar chest since then. When I saw the black, white, red, and blue, I said, "This is going to fit PERFECTLY in Levi's room!" Plus it has a tractor and a barn on it. So that's love. Then POW a flash of brainstorm hit me one day during nap time. I could use left over embroidery hoops to create sports balls to hang on Levi's wall. "Wow, MOM, this is AMAZING!" I feel like the room is really Levi's now. 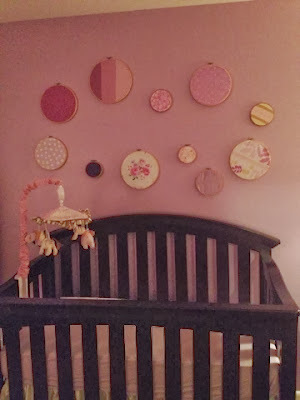 It's not some nursery that I planned for months that is coordinated just right (although I LOVED that, too). This is him - it's all the stuff he loves!